PL G23 and G24 LED Bulb is designed to replace fluorescent PL Lamps in their existing recessed canned fixtures. Our PL G24 and G23 LED Bulb are CE,ROHS and UL Listed and with a 3-5 year warranty. We offer both vertical and horizontal PL LED lamp options for existing recessed can applications, as well as Plug and Play LED lamps. Using compact fluorescent lights in your facility will be pay more on lighting-related energy costs than you need to. If we compare PL LED bulb with fluorescent lighting technology, LED is always the winner in many aspects. In addition, your facility could be negatively impacted by the heat generated from fluorescent lighting, the bothersome flicker or glow of the lights and various other downsides associated with compact fluorescent lighting. If you want,you can easily upgrade from fluorescent bulbs to PL G23 and G24 LED Bulb. Innovative LED lighting technology is taking over compact fluorescent lights(CFL) because LED lighting has proven to be reliable, versatile and energy efficient.When you choose to purchase and use PL G24 and G23 LED Bulb rather than compact fluorescent lights, you will discover that you can dramatically reduce your energy costs. In fact, in some cases, you may reduce your costs related to lighting your facility by 50% more by making this simple upgrade. Also,PL G23 and G24 LED Bulb have more than 50,000 hours lifetime. This is more than three times as long as the lifetime of a compact fluorescent light bulb. Reducing maintenance tasks around your facility can be truly beneficial, and this is a great way to do so. As you can see, it is wise choice to convert traditional stadium lighting into more energy efficient LED outdoor arena lighting, with all LED arena lights containing no mercury. Our G23 LED lights can replace all the G23 compact fluorescent lights. And our G24d LED lamp can replace G24d-1 and G24d-2 compact fluorescent lights. Our G24q LED lamp can replace G24q-1 and G24q-2 compact fluorescent lights.You can choose from a variety of PL G23 and G24 LED Bulb ranging from 6 to 15 watts and from 600 to 1,500 lumens. For more information about our PL G24 and G23 LED Bulb, or to order any of the PL LED lights below, just contact us. Our LED lighting experts are waiting to communicate with you. As a leading PL G24 and G23 LED Bulb manufacturer, we will advise you on our best PL G23 and G24 LED Bulb for sale to meet your needs. We design all our plug in PLC LED lamps with Philips and Sumsung 5050/2835 LED chips. This means our PL LED bulb has high lumens which is more than 105lm/w. Using our high efficient LED lights will help you and your clients to save more energy and cost. Our PL G23 and G24 LED bulb have varied series and power for you to choose. You can find all the solutions for your needs if you choose us as your PL G23 and G24 LED bulb supplier. 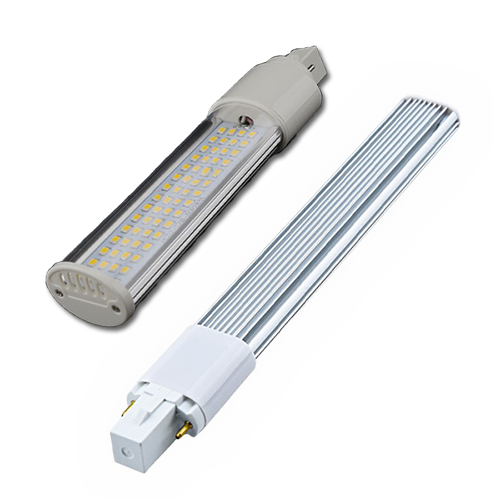 For example, our PL G23 LED lamps have different power from 5-13W to relace 10-26W compact fluorescent lamps (CFLs). Our PLC G24d LED lamps can replace G24d-1,G24d-2 and G24d-3 compact fluorescent lamps (CFLs). Our PLC G24q LED bulb can replace G24q-1,G24q-2 and G24q-3 compact fluorescent lamps (CFLs). We use high quality CE and ROHS listed LED driver with our G24 and G23 LED lights. Also we use aluminum alloy as heat sink. This will ensure our LED lighting with 50,000 life span. What is 50,000 hours? If you ran one LED lamp for 6 hours per day , it would last for nearly 23 years. So you may never change another light for long period. You do not have to choose between inefficient incandescents and fluorescents that contain mercury. Our G24 and G23 led retrofit is safe, environmentally friendly and contains no toxic mercury. Our LED lights use 30%-50% energy to traditional lights. As we know,consuming less energy results in fewer greenhouse gas emissions being released into our environment. It is easy to install our G24/G23 LED lamp. What you need to do is just disconnect of bypass the ballast. Then you can position the PL LED lights directly. With our professional technical team, we design our G24/G23 LED lights with the most attactive appearance. LED lighting is the most gorgeous lighting that illuminates people and surroundings in colour-rich light. Our LED lights are designed to blend seamlessly with any architecture. Also,the proprietary diffusing lens and reflector system delivers an optimal light distribution. Why we should use PL-C G23 and G24 LED lights to relace compact fluorecent lights ? The are some advantages to use LED lamps instead of CFLs. 2. No ballast. Our customers have told us that when a PL bulb fails, it produces a smell that is similar to a burned smell. Then you need to buy a new ballast. Converting over to PL LED Bulbs allows you to remove the ballast. 3. 50,000 hours of lifetime. You will be on your third set of CFL bulbs before you will have to replace the LED PL bulb. How to install G23 or G24 PL LED lamp ? Why you use the aluminum alloy as heat sink ? We use heat sink of aluminum alloy as the cooling technology. The will ensure the heat produced by LEDs transfer to the air easily. That’s why our PL-C LED lighting has a long lifetime. This is one factor to make us to be a leading G24/G23 LED bulb manufacturer in China. What's the difference between g24d and g24q ? My CFL is G24d-2( or G24d-1/ G24q-2/G24q-1/G24d-3) base,how I choose the G24 LED lights ? It is easy to choose the G24 LED lights. G24d means that the CFL has 2 pins. G24q means the CFL has 4 pins. Our 2 pins G24d LED lamp can replace CFL with G24d-1,G24d-2 and G24d-3 base. Our 4 pins G24q LED lamp can replace CFL with G24q-1,G24q-2 and G24q-3 base. Can we use controller with your LED Lighting ? Yes, you can. You can use owner controls which are remotely programmed and operated off-site. Our LED lights can be short cycled and deeply dimmed without harming the fixtures or creating objectionable flicker. You can learn information about led light controller here: lighting control system. How do you ensure the quality of you G23/G24 PL-C LED lamp ? We use CE/ROHS listed LED driver the our PL LED lamps. Also,we tested all the led lights for more than 24 hours before we delivery it to you. That’s why we’re one reliable G23 and G24 LED light supplier since 1998. You can check the following video about this model. What to expect in a standard warranty of this PL LED lamp ?